Anyone who takes poker seriously understands the importance of understanding the math of the game. Knowing basic probabilities and "poker math" informs decisions regarding most aspects of the game. A couple of weeks ago a friend of mine who wasn't a poker player asked me what was kind of a "poker math" question. It was a common one: "What percentage of poker is luck and what percentage is skill?" I'm calling it a poker math question in part because it was a question about poker that also was asking me to produce percentages and quantify an aspect of the game. But there are other more pertinent reasons why the question is really about the math of poker. For one, understanding the role luck plays in the game means knowing the math behind poker — that is, knowing odds and probabilities and how sometimes when you make a good decision you still lose, or how sometimes when you make a bad decision you still win. Secondly, possessing that knowledge and knowing how odds and probabilities and other "poker math" can (and should) affect decision-making in poker is itself part of what it means to be a skillful player. Some players come by this knowledge instinctively, seemingly understanding the math of poker without ever having to study it in a conscious fashion. Others learn it by trial and error, and after failing a number of times to fill their straights or flushes a certain number of times finally begin to appreciate how learning poker math is worthwhile to do. From the game's earliest history, though, everyone who has taken poker at all seriously has come to realize the importance of understanding the game's math component. Looking back through the history of poker, the game was introduced in America during the early 19th century. The original game used a 20-card deck and involved simply dealing out five-card hands with players subsequently betting on them. In that game, knowing hand rankings and a little something about the chances of making certain hands would obviously serve players well, though the associated math involved wasn't terribly complicated. Later came the standard 52-card deck as well as the introduction of the draw, meaning players could bet both after the initial deal and then again after discarding and drawing cards to improve their hands. Sometime after that came the introduction of five-card stud then later seven-card stud, new variants on the game that provided new challenges as well as even more betting rounds. Poker was becoming more complicated, and so, too, was the math of poker. Toward the latter part of the 19th century came the first poker strategy books, with many of them focusing on the math behind poker in addition to explaining the rules and other aspects of the game. The title of Henry T. Winterblossom's book The Game of Draw-Poker, Mathematically Illustrated (1875), one of the first full-length books about poker strategy, gives you an idea of the author's emphasis on math in poker. Over subsequent decades other strategy writers continued in the same vein as Winterblossom, including in their texts tables full of numbers illustrating the chances of filling different draws. With regard to five-card draw Mike Caro famously shared the math and showed how to apply it at the table in Doyle Brunson's Super/System (1979), to which he also contributed many more tables explaining odds and other math for numerous other variants. Texas hold'em is among the games covered in Caro's tables, and as the 20th century drew to a close first fixed-limit hold'em and then no-limit hold'em became the most played poker variant by far, with NLHE tournaments especially popular both online and live. Along with the "poker boom" of the mid-2000s came an explosion of poker strategy texts, many aimed at beginner level players and thus usually touching on math-related concepts in poker. Tournament strategy books like the Harrington on Hold'em series (2003-2005) by Dan Harrington and Bill Robertie popularized certain math-related concepts like "M" (or the "M-ratio"), a calculation reflecting how deep or shallow a player's chip stack is as determined by the cost to play each orbit. Later tournament strategy books would routinely include considerations based on ICM or the "independent chip model" that uses math to calculate the real money equity of a player's chip stack as indicated by a tournament's payout schedule. There have been several popular "poker math books" over recent years as well — that is, books which primarily focus on the math of poker. Among those titles, The Mathematics of Poker (2006) by Bill Chen and Jerrod Ankenman well demonstrates for the importance of math in poker, with the authors introducing a variety of quantitative techniques that apply to poker strategy, including game theory. The Math of Hold'em (2011) by Collin Moshman and Douglas Zare also covers a wide range of Texas hold'em math concepts from odds and probabilities to equity and variance. Applications of No-Limit Hold'em (2013) by Matthew Janda builds even further on the idea of using ranges (both your own and those of your opponents) in order to help with decision-making and bet sizing. Meanwhile Essential Poker Math (2015) by Alton Hardin is another popular title that focuses on basic fundamentals including odds and probabilties, equity, and expected value. Of course, today players learn poker strategy by a variety of other means besides reading books, and indeed more often than not will opt for other forms of instruction such as provided by poker forums, coaching sites, videos and live streams, and other sources. Regardless of the approach, however, poker players seeking to improve their games and strategic know-how necessarily come up against the inescapable truth that understanding the fundamentals of poker math is essential. 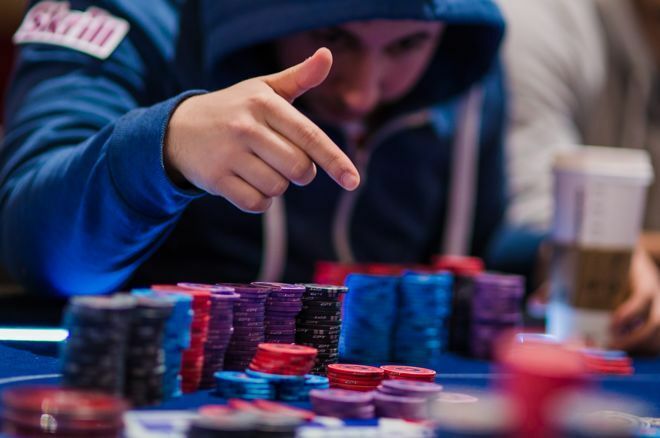 Knowing basic probabilities helps inform decisions regarding practically all aspects of poker, from starting hand selection to the narrowing of hand ranges when making a big river decision. Understanding other fundamentals like how to count outs, how to calculate pot odds (and implied odds), how to calculate expected value and the like serves as a necessary foundation on top of which other winning skills can be developed. How did I answer my friend's question? I had to be truthful and say that what he was asking for wasn't quantifiable — that you couldn't really pinpoint what percentage of poker is luck and what percentage is skill. Knowing that wasn't going to satisfy as an answer, I added how luck can sometimes matter more when it comes to a single hand or a short period of play (say, just one tournament), but that over the long term skill tends to be more important. Of course, anyone who knows anything about the math of poker already knows that. Randomness in Your Poker Results? Don't Forget "Regression to the Mean"